On Tuesday, October 2nd, the Save the Bay campaign held our first official table to kick off Plastic Free Tuesdays here on campus. 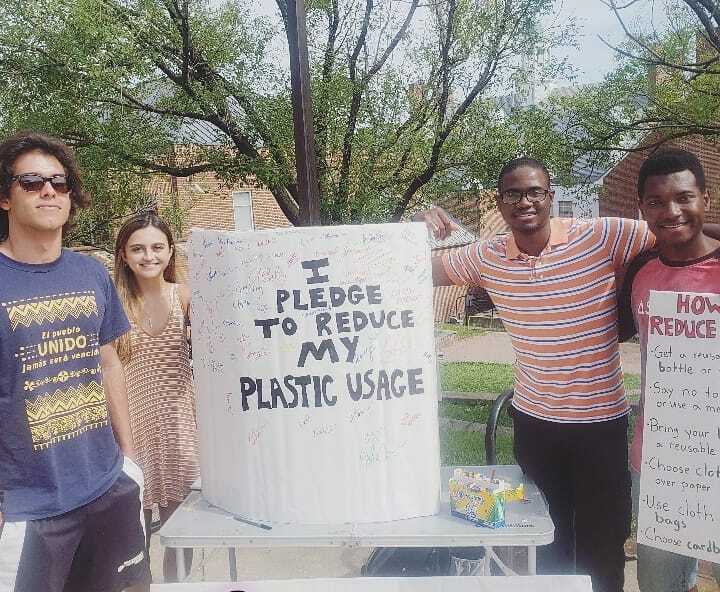 For three hours, we talked to students going in and out of Stamp to make them more aware of the problems associated with using single-use plastics and also to have them sign a giant poster board to pledge to reduce their plastic consumption. This is the first step in our efforts this year to make every Tuesday a day where students on campus will avoid using single-use plastics, like coffee cups and food packaging. As the grassroots coordinator for the Save the Bay campaign this semester, I’m very excited to watch our movement grow. I hope to reach a point where it is a norm on campus for students to bring their own reusable cups to the campus cafes and to carry their food in reusable containers. If we can get people to make these changes concerning their plastic usage for one day out of the week, I think that students will realize that not using plastic is something that isn’t hard to achieve on a weekly basis. I first got involved with MaryPIRG my fall semester of freshman year. I was beginning to explore Environmental Science as a major, and I knew that I wanted to be involved in some kind of environmental work here on campus. I joined a few other clubs that were environmentally focused, but I found that they weren’t as active as I would’ve liked. I was really excited to become a member of MaryPIRG’s Save the Bay campaign because I felt like I was making a real impact. I had known about the campaign’s success with working to ban fracking in Maryland, and I knew that I wanted to be a part of such an important group on campus. This semester, I’m eager to continue encouraging students to participate in Plastic Free Tuesdays. I’m especially looking forward to our first campus clean-up event, as we will post pictures of the plastic pollution that we find around campus, and will tag the brands that these plastics come from in order to make these corporations more accountable for their environmental impact.